On Thursday, March 30, 2017 – two days before the convention – I finally finished my cosplay. What happened between my last post and now wasn’t all that interesting. We (me and my dad, who has power tools and a greater knowledge of industrial materials than I) got the boots put together, painted and bolted on the heels, made sure I could walk around in them (I could), riveted on the straps, fixed up any little cracks in the paint, painted the details on the sides of the boots, and got ahold of all the clothing. Ironically, the tank top was the most difficult part of the whole cosplay, including everything I did with the boots. The first time, the t-shirt transfer burned when I ironed it on; the second time, it immediately tore when I tried to put it on (that’s what I get for buying a nearly transparent tank top for three bucks at Walmart). The jumpsuit, which was tied around my waist, felt basically like a pair of nice sweatpants. From the knees up, it was probably the most comfortable cosplay I possibly could have done. Fast-forward to April 1 – yesterday. My nerd crew and I – which consisted of my two best friends, my little sister, both of my parents, and both of one of the two best friends’ parents – drove all the way to Dallas, Texas for this year’s Fan Expo convention. I don’t live in Dallas, but it was closer than the big daddy ComicCon in California, so we decided it would do. Last year, I went with one of my friends and my mom, and it was crowded enough. That year, I wore my ugly hand-me-down athletic shoes instead of my standby green Converse, fearing that my feet would hurt after walking around all day in Chucks. This year, it was doubly crowded, and I went for just short of six hours wearing a pair of six-inch-tall torture devices on both feet. My feet still hurt too badly to walk normally, but it was totally worth it. 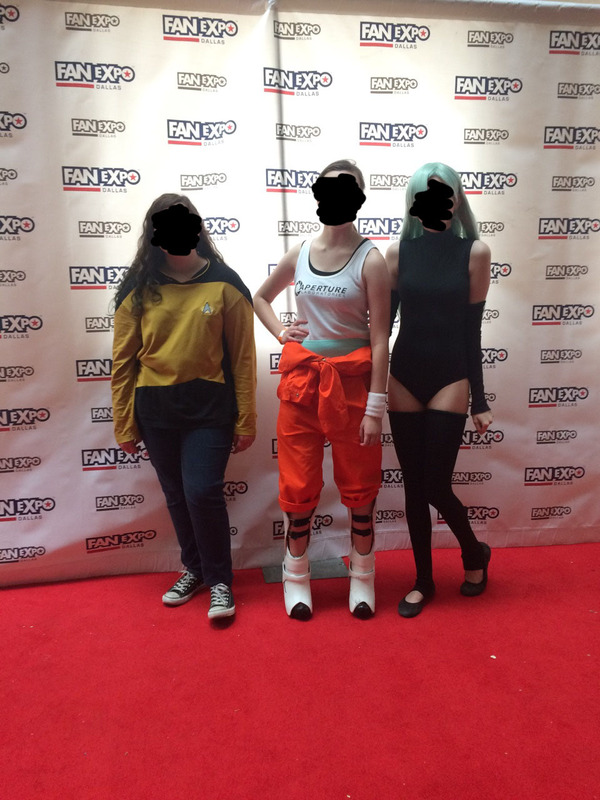 The three of us on the cosplay red carpet, sans faces, because internet safety is good. All nine of us cosplayed, and only one of us did it halfway. I was Chell, of course. My little sister was Daenerys Targaryen, which was appropriate, because she has a dragon obsession beyond any dragon obsession I’ve ever seen an eight-year-old have. The friend on the right of the picture above, henceforth referred to as Tall Friend, was Princess Elizabeth from Seven Deadly Sins, a Netflix original series that isn’t actually an anime. The friend on the left, Short Friend, couldn’t decide who to be, so at the last minute she decided to be Random Star Trek Personnel in Jeans and Chucks. My mom, who is not into cosplay (or most fiction in general), also went generic as a Dharma Initiative security officer, complete with a walkie talkie. My dad was Obi-Wan Kenobi, whom he kind of looked like already. Tall Friend’s mom was Effie Trinket from The Hunger Games, and she looked so perfect it was kind of scary. Tall Friend’s dad also went Hunger Games-themed, because he went as Cesar Flickerman, but he was also wearing a Deadpool mask and gloves, which worked out a lot better than you would expect. Baby Daenerys got her picture taken with Big Daenerys. They were wearing the same dress. It was adorable. Also, yes, Short Friend is holding a painting of Daredevil. To get an idea of the scale of this thing, I might add that both Stan Lee and Mark Hamill (aka Luke Skywalker, for the plebeians who have to ask) were guests this year. I didn’t actually see either of them in the flesh, because the crowds were absolutely insane, but I got to watch the friend in the Star Trek shirt shake hands with James Marsters (Spike on Buffy the Vampire Slayer) twice. We started out with a little bit of shopping, as one does at a convention. I got my picture taken beneath a giant inflatable turret. I was so afraid of overspending that I ended up buying nothing except a grab-box-type-thing, most of which I will probably be Ebay-ing before long, but it was a great opportunity to make my way around the convention center and see as much of it as I could. I lost count of photo requests around 6 or so, but there was no shortage of stares and the odd “Whoa, look at those boots! What’s she from?” Tall Friend, aka Princess Elizabeth, got quite a few as well. 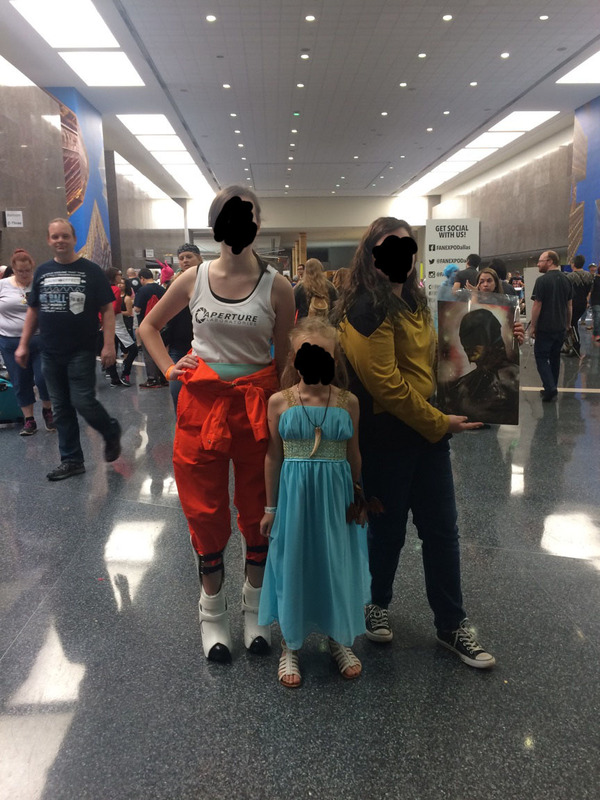 Once, she encountered these two little girls, both about ten or eleven, who were literally squealing and jumping up and down, they were so excited to see their favorite character come to life. I got my picture taken with a tiny little kid, about six or seven, who was dressed as a Black Mesa security guard. It just goes to show that any barrier can be overcome by a common fandom. We went to the panel featuring two of the voice cast members (Josh Grelle and Trina Nishimura) for the English dub of the anime Yuri!!! on Ice. I’ve never even watched the anime, but I found the panel quite interesting. The Q&A portion of the panel was special, to say the least. I’m not going to repeat it exactly, because this blog is rated G, but I’ll just say that it involved non-canonical ships and a weirdly specific innuendo that was straight out of a bad fanfiction. Tall Friend, the anime lover, stood in line for an hour and a half to get Todd Haberkorn’s autograph. I’m not certain who he is, but I know he’s from Fairy Tale. Short Friend, who also loves anime (but not Fairy Tale) stood in line for forty-five minutes to get James Marster’s autograph. Since she had the food, I went with her. This was at about 3:30 p.m. We arrived at the convention at about 10:00 a.m. I had been wearing those rock-solid boots, with the two-inch platform, the six-inch heel, and the insane springs on the back, for about five and a half hours. By comparison, a playthrough of Portal 2 generally takes me about two to four hours, depending on the seriousness of the gaming. I had officially been wearing those suckers for WAY longer than they were meant to be worn. The seven-dollar dress boots I used for the base had next to no ball-of-foot support, and I felt like my ankles were about to collapse. They looked pretty sick, though. I put on Converse and I felt much better. We did some pretty awesome stuff, such as posing for photo ops with all manner of cosplayers much more experienced than us (all of whom were first-timers), but we had our fair share of shenanigans as well. Cesar Deadflickerpoolman, as we started calling him, sneezed inside his mask, which was as unpleasant to watch as it must have been to experience. Tall Friend, whose cosplay showed a couple of inches of thigh, got recruited by a professional photographer to be photographed holding a sign that said “Cosplay Is Not Consent.” I guess that’s a passive-aggressive way of telling someone to put some clothes on. Even though it hurt like heck, I had so much fun. Honestly, it feels great to have the deadline over with. I don’t have to worry about meting out my free time to allow for cosplay work anymore. 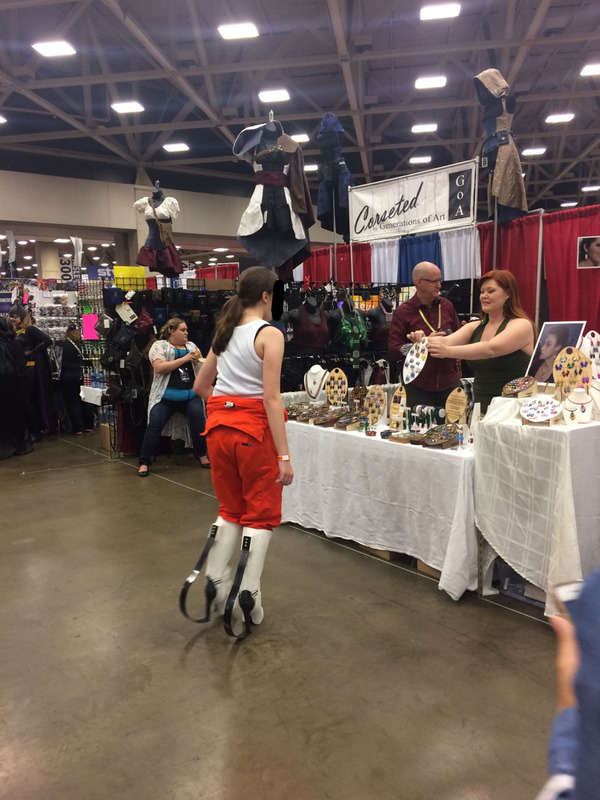 All that work was completely worth it; I saw exactly one other Chell at the convention, and she was wearing a normal, boring pair of black leather boots. I had an awesome time hanging out with my friends and convening with fellow nerds of every kind. It was way too much fun to laugh at really horrible cosplays, most of which incorporated far too much Spandex in places that should never, ever be covered with anything so tight (but not to the cosplayers’ faces – I’m not that mean). No one’s cosplay broke, no one got injured, and no one got stolen from; from where I’m sitting, that looks like a pretty successful day to me. I can’t wait for next year. Portal 2 Cosplay: Finished with the first pieces! It’s been, like, four weeks since I last posted, and you may think I’ve kind of forgotten about this. Not so! I’ve been working on it so much I actually threw off NaNoWriMo (which I ALWAYS do) to work on it. And I’m glad to say that the first pieces are finished, painted, and glued in place! Here’s pretty much how it went: Bondo, sand, Bondo, sand, fill, sand, glue, sand, prime, sand, prime, sand, prime, sand, paint. My hands were so raw from all that sanding that the fingerprint reader on my phone stopped accepting my fingerprint, and my hands are still stained Bondo grey. Nothing of interest happened during the sanding phase, so here’s a picture of what my porch looked like shortly after I finished shaping the pieces. I’m still getting the filler dust out from under my nails. Once I sanded them, my helpful dad and I primed them. They were so smooth, it brought figurative fangirl tears to my eyes. 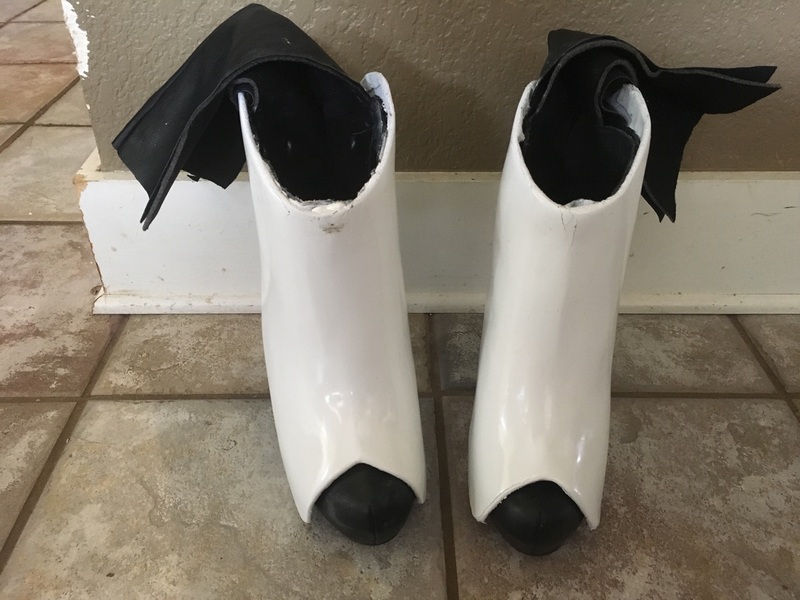 I spray-painted them white, cut the boot to the way I needed it, and marine-sealant’ed that sucker on, with some assistance from my helpful cosplay dad. And they smell like a car shop. The bad news is I can no longer actually get them on in a reasonable amount of time, since they aren’t as flexible as they were before they were covered in auto body filler. The good news is, I can fix that with a zipper on the heel, and OMG I ACTUALLY JUST FINISHED A WHOLE FLIPPIN’ PIECE. Are they perfect? No. Who cares? This is my first cosplay, and, considering I didn’t just say “screw it” and painted a pair of leather boots, I’m doing pretty well. Anywaaaaay, thanks for checking me out! Portal 2 Cosplay: All finished with Worbla! I’m so sorry I haven’t posted in so long. With everything that’s been going on, I haven’t had much time to work on my cosplay. 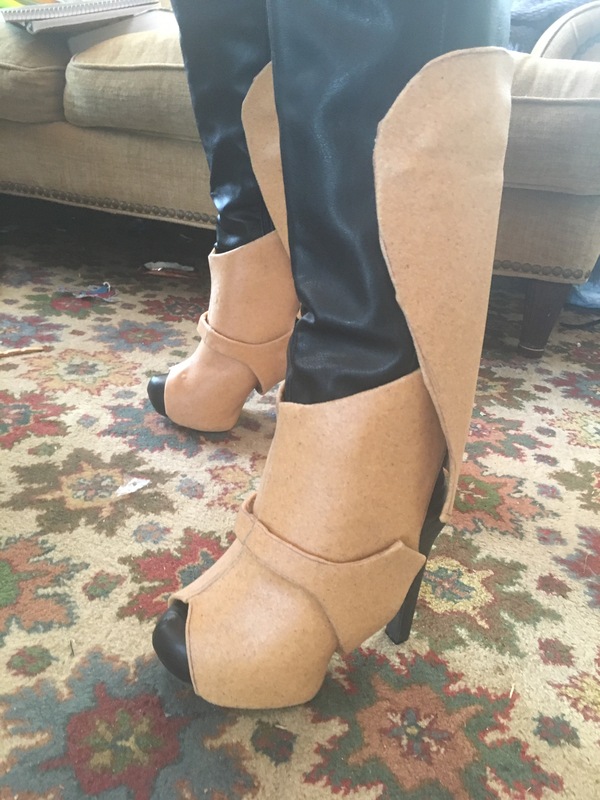 Anyway, I’m all finished with the Worbla part of the boots. My next step will be to shape them a little before I cover them in Bondo and sand them down to get them all nice and smooth. Remember how I said this time I’d have more pictures? I don’t. Instead, I have a video, detailing how I make my foam-and-Worbla sandwiches and how I made that difficult-to-explain toe piece. You also get to see my arms, my shirt, and my hair, so that’s fun. As you can see, none of the pieces are actually attached yet (not to the boot or to each other), which is why they look so awkward. Note: the piece on the ankle isn’t actually nearly that big. The little strap in front had just slipped down, so it looks enormous. All I have to do now is Bondo them, paint them, and then do the heel (yuck). 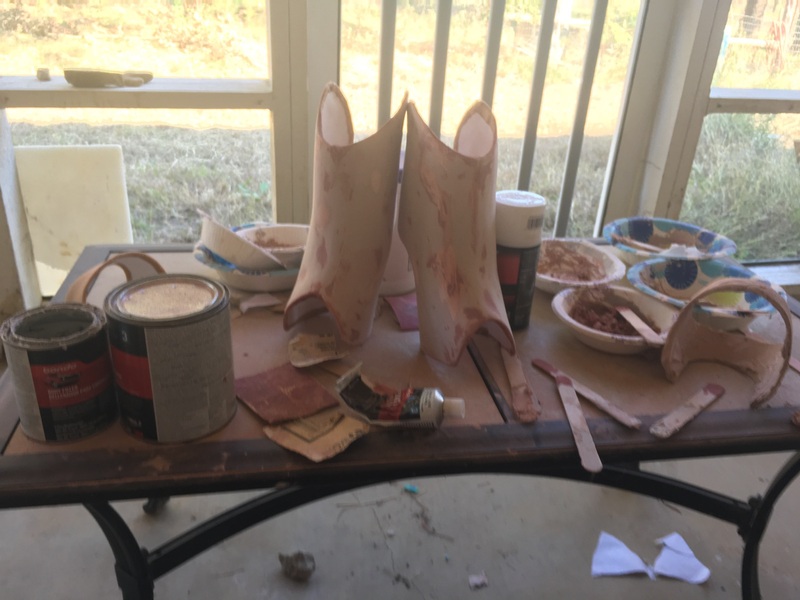 Also, an advance warning: since most of the cosplay process detailed in this post involved me using heat guns and struggling to form plastic and foam before it cooled, there are very few pictures of the process. I’ll do my best to describe it to you, or provide an alternate tutorial/demonstration where I can. Before I get started on the process, I think I’d better cover the materials I’m using. Everyone knows what craft foam is, but the key component of these pieces is a material called Worbla. Worbla is a thermoplastic, which means it has a low melting temperature and can be easily heated up and molded. It’s about a millimeter thick, flexible, and a key component in many professional cosplayers’ wardrobes. The first thing I did was slightly alter the pattern for the toe piece. It was large enough to fit the boot, but it didn’t wrap far enough around the back, and it was going to cause some weird gaps if I didn’t fix it. I made it a little larger by tracing it onto a piece of posterboard, drawing on the extra width, cutting it out, and taping it on. I was worried that I might not have enough Worbla for the new, larger pieces, but they turned out great. At the time I made these components, I had a 15″x19″ piece of Worbla that I’d bought previously just to play with. I also had an enormous roll of craft foam, which is the first thing I used. 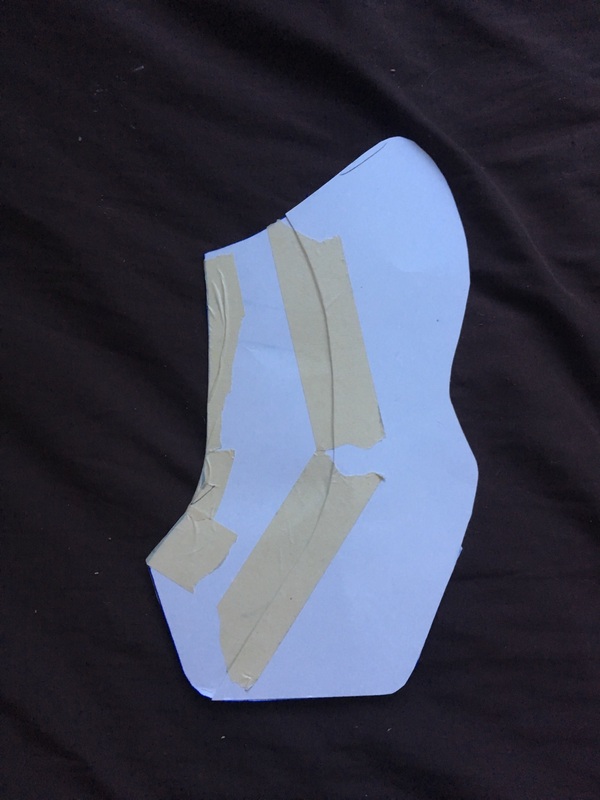 I traced the patterns onto the foam (once for the ankle piece, twice for the toe piece – you’ll see why in a minute) and cut them out. Next came the first somewhat dangerous part. Yay, danger! I got ahold of my trusty heat gun (actually, it’s usually rather unreliable, and extremely hard to turn off – but you get what you get) and heated up the Worbla until it was floppy. I centered the foam on the melted plastic and wrapped the plastic around the edge. I now had three pieces – one ankle piece, two mirrored toe pieces – that looked as though they were made of thick Worbla, when, in reality, they were foam with little Worbla hats on top. I’m really sorry for the weird stripey shadows; lace curtains and photography don’t really mix. 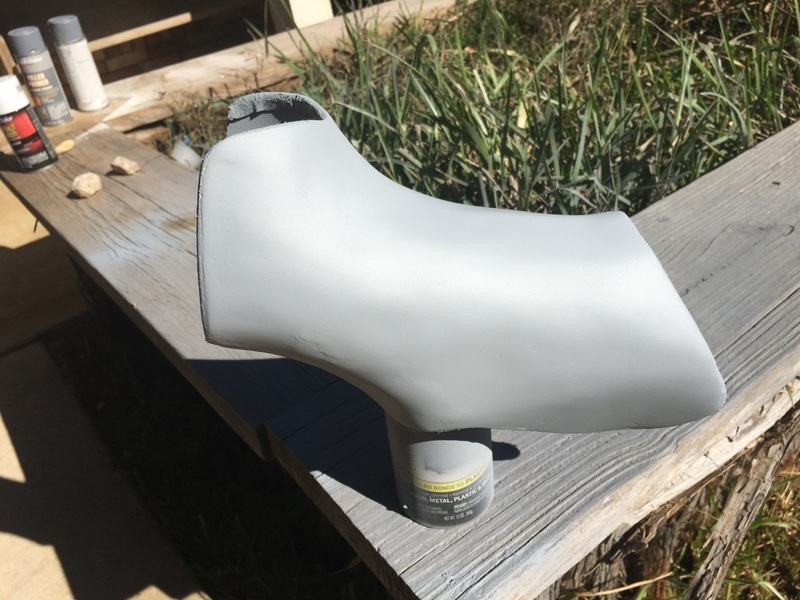 My next step was to make the flat pieces into components of the boot. Remember how I was confusing everyone by talking about the piece that goes on the “bottom”? You’re about to see what I meant. I grabbed the boot I was going to use and stuffed it with plastic bags again. I took one of the mirrored toe pieces and conformed it to the side of the boot. (Sorry I don’t have any pictures!) I took the other piece and did the same, but on the other side of the boot. Now I had two halves of the shell that was going to go over the foot part of the boot. It was sort of like those phone cases where the front piece snaps onto the back piece, if that makes any sense. My next step was to join them. I heated up both pieces, sandwiched them back onto the boot, and connected them along the front of the foot, so now, instead of having two halves of a “boot case”, I had one “snap-on” one. This was the final product. Don’t worry about the weird bubbles on the side; I smoothed them out later (and made the Worbla fit more tightly as well). If this step was a little hard to understand, I’m sorry. Kamui Cosplay has (to the best of my knowledge) never made a pair of long-fall boots, but Svetlana made a pair of bracers using almost the same technique, so, if you want, you can watch this video to better understand what I did. Now that the toe piece was squared away, I got to work on the ankle piece. Since I’d done this one a hundred times with the posterboard version, this one was super easy. All I had to do was wrap it around the foot of the boot and connect the parts that needed to be connected. There were just a couple of hiccups: one, the part that attaches across the front of the foot was slightly too short. When I made my patterns, I hadn’t realized that it was going to be wrapping around the toe and ankle piece, which is a lot thicker than just the boot. 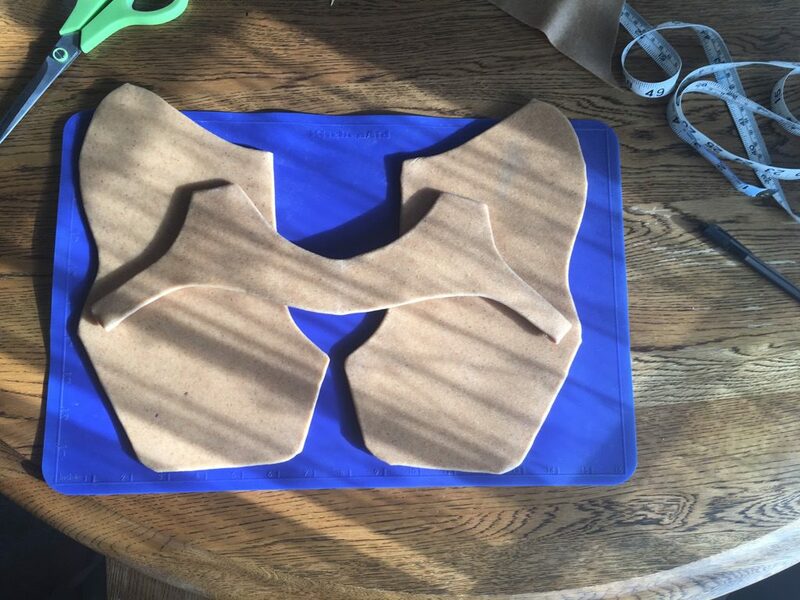 It was really easy to make a little foam-and-Worbla square to connect them in the center. The hardest part was keeping the ankle piece and the toe piece from sticking together. To keep both pieces removable (which was vital at this point, seeing as I hadn’t sanded or painted either piece yet), they needed to stay separate. I’m not actually sure what that red thing on the floor is. I think it’s a lid of some kind. As you can see, the piece wraps around the front and bottom of the boot, with two tabs sticking up (one on each side) for the back piece to attach to. And it goes over the toe piece, which is what I meant when I said that the toe piece would be the lowermost one. I haven’t done the back piece for a multitude of reasons. I was originally going to use Sintra (a low-density PVC plastic; it smells nasty, but you can heat it with a heat gun as well), but it proved far too industrial for my uses: I couldn’t cut it without power tools, it was nearly impossible to mold, it wouldn’t stick to Worbla (which is kind of vital), and it lets off some pretty nasty fumes when you heat it. I could have used more foam and Worbla, but there were a few things wrong with this too. Firstly, I’d used all my Worbla on the other two pieces, and I didn’t want to buy more without knowing whether my idea was going to work or not. Secondly, I can’t forget about the brace on the back that’ll take the place of the heel: it’s going to have to be strong enough to hold up all of my 110 lb., and there’s no way I’m going to be able to attach something so heavy-duty to something so flexible. My dad and I did some scheming, and this is the plan we came up with. We’re going to make the braces out of aluminum bars. 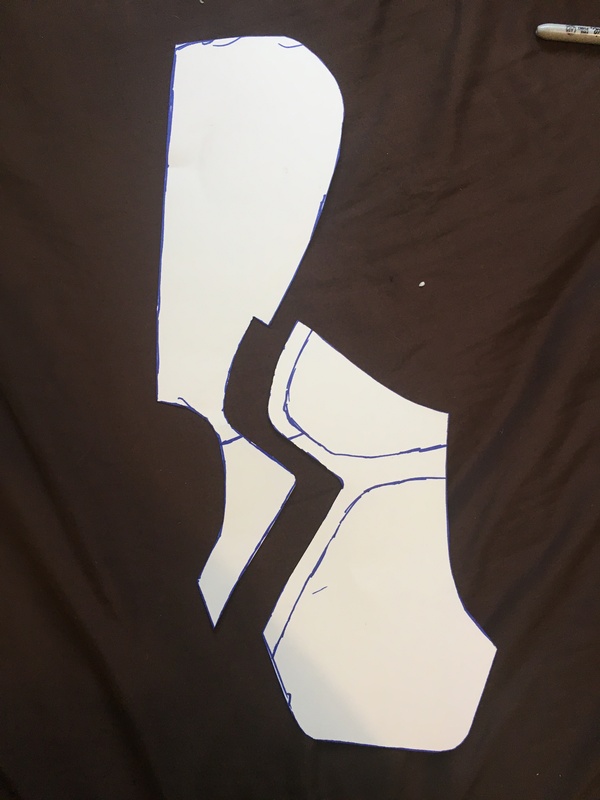 The back piece will also be aluminum, with a reinforced piece where the brace will attach; it’ll be riveted to the back part of the toe piece (thank goodness I made my pattern bigger!) and covered in Worbla so it can be easily painted and attached to the appropriate tabs on the ankle piece. 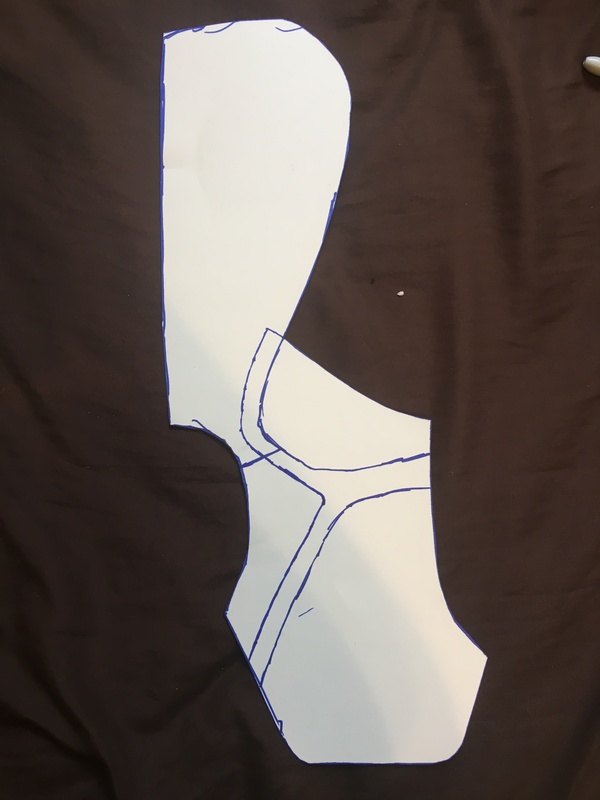 Since aluminum is a lot harder to shape than foam (and since my pattern was slightly overlarge anyway, since I forgot to account for the thickness of the finished pieces), I cut a slit in the back of my back piece pattern. I’ll bend the pieces inward to close the gap in the back, and it’ll make a nice curve. My next order of business is to buy more Worbla and make identical pieces for the other boot. Next time, I swear I’ll take more pictures!! Thanks for reading, and stay tuned for more updates on this project! Hey, nerds, and welcome (back) to TFG! This post is a continuation of my first pattern-making adventure, so I suggest you read that one first. 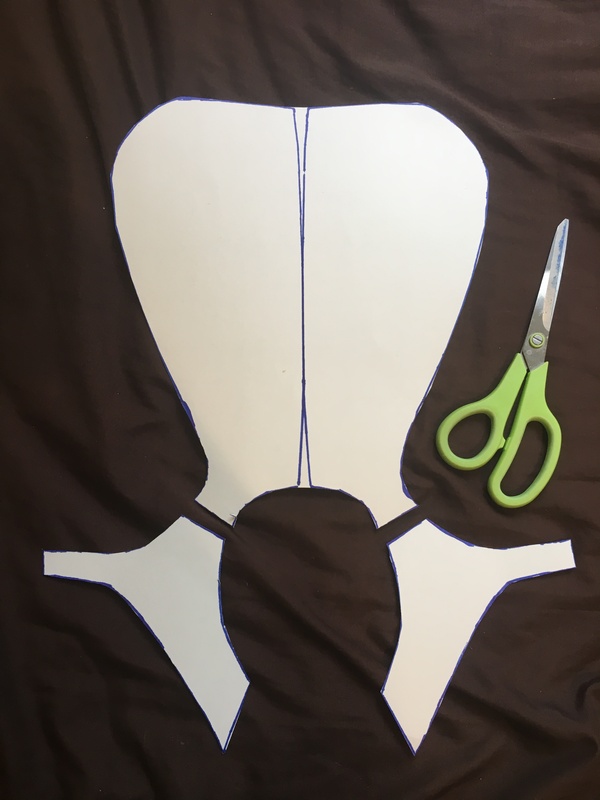 My last post concluded with the creation of my master pattern, which is basically a 2D-ization of all the pieces I’m going to need to construct the plastic parts of Chell’s long fall boots. 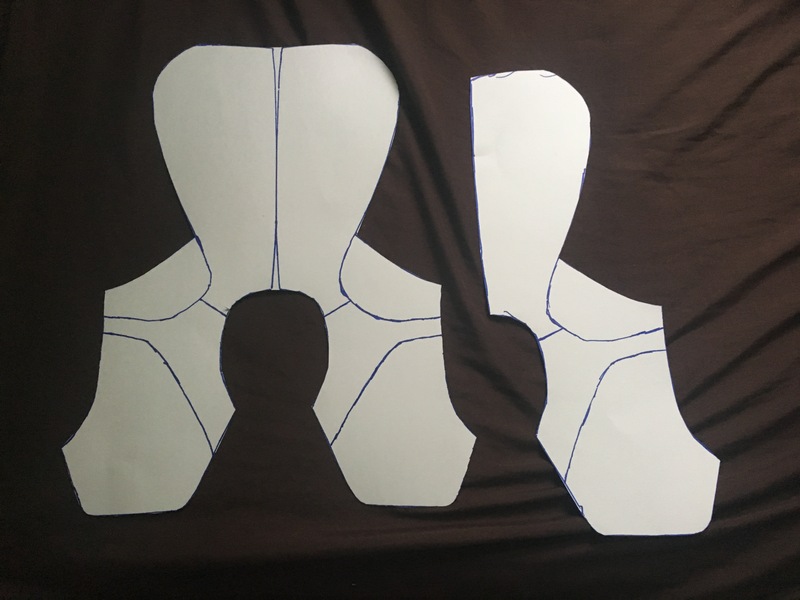 The final boots will consist of four different pieces (two of which will be more or less fused together, so you can call it three pieces if you want), so my next step was to use my master pattern to construct the patterns I’ll need to make the smaller components of the boots. 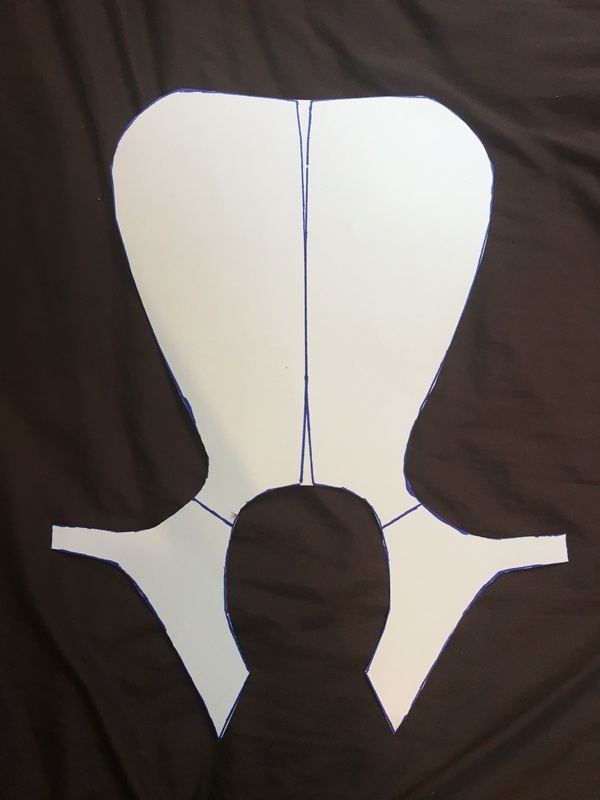 First, I got ahold of the half-pattern that I used to make the two-sided pattern that I’ll be using in this post. Here’s all the patterns I’ll be using, side by side. The first thing I did was make a pattern for the piece that will be under the others on the front of the shoe. (Look at this reference pic; you’ll know what I mean.) 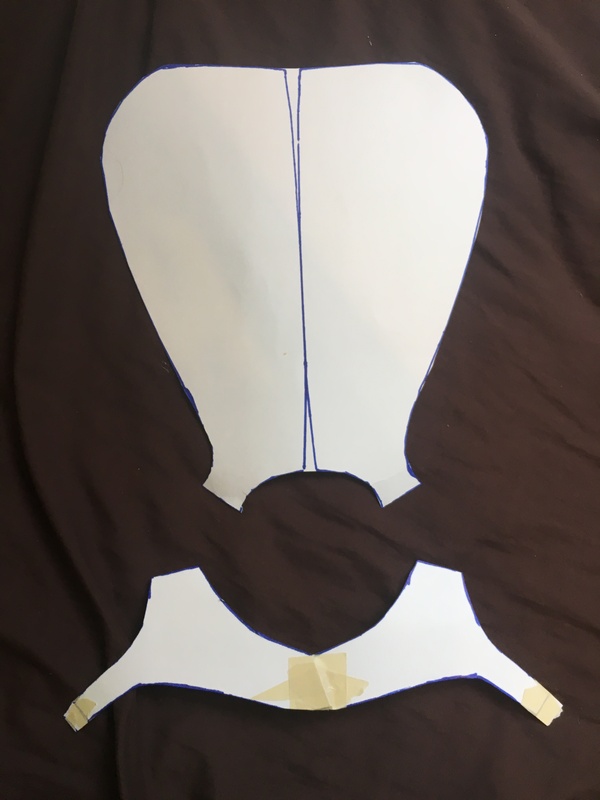 Ignoring the back piece and the strap that goes across the front of the foot, I added half an inch to the edge of the piece, traced it, and cut it out. It’s always better for your patterns to be too big than too small; you can cut away extra material, but it’s really hard to add it back. I traced half an inch around the front piece. Then I cut it out. I set that piece aside for a while and got to work on the outer pieces of the boot. 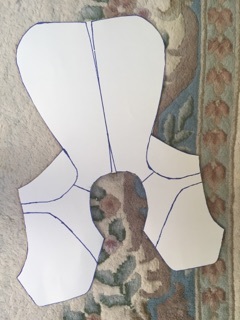 I took the master pattern that I made in my last post, cut off the parts that will be made using the pattern I made in the last paragraph, and separated the two pieces I’ll be using. After cutting off the toe and ankle piece. I split the piece along the lines. Instead of keeping the ankle strap as two separate pieces, I taped the two patterns together, connecting the sides of the pattern that will be on the bottom of the shoe. Masking tape is my friend. This is the part where I miscalculated and ended up spending forty-five minutes fine-tuning a pattern that I didn’t even need. I won’t post any pictures of it, because it’s not worth your time to read, but here’s the moral of the story: when making two patterns that will connect to each other, check how they actually connect before you decide that one of them is too small. 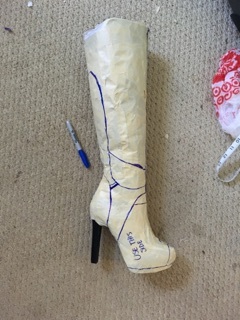 So, anyway, my next REAL step was to connect the new taped-up lower pattern with the pattern for the calf plate. It made a nice curve around the heel, which means that it’ll look even better when it’s made of thermoplastic and not cheap posterboard. I put it on the boot to see if it would fit. With a few adjustments to the lower piece, it did. I detached the two pieces from each other and got to work on the third piece. I traced my cutout piece on my posterboard to make an identical cutout piece. I taped them together along the top of the foot to make a shape that was really awkward when made out of posterboard, but will look a lot better when it’s made of Worbla. It lays really strangely, being posterboard and all, but it fits. My next step was to make sure I’d made all the patterns correctly. Using masking tape (which is the only tape you should use for this step, since it’s easily cuttable/tearable/removable), I attached all the pieces to each other the way they will be on the final piece, and put it on. I didn’t get any pictures of this stage, since it was kind of hard to hold together properly (being paper and all), but the important part is that it worked. Here’s a picture of all of my final patterns, side by side. The one on the bottom looks like some kind of underwear, but it’s functional. Another thing I did was decide what materials I’m going to be using for each part. For the calf plate, I’ll be using this stuff called Sintra, which is basically foamed-up PVC, meaning that it’s tough, flexible, and holds its shape, but its density is low enough to be moldable when it’s heated up. For the other two pieces, I intended to use Worbla (which is magical stuff – if you’re into cosplay, you’ve probably already heard of it), but it ended up being way too thin to look okay with the relatively thick 3mm Sintra. So, instead of using Worbla alone, I decided to use craft foam and then cover it with Worbla afterward, to make it stiff, paintable, and more easily shaped. It’s always a good idea to try before you buy, though, so using the little bit of each material I already have (and the craft foam I ordered off of Amazon today), I’ll experiment and make my final decision before I go to the trouble of purchasing the rest of the materials I’ll need. Stay tuned for updates on this project! It’s late September, and you know what that means! It’s time to start thinking about next year’s ComicCon cosplay! Yeah, okay, maybe it’s not for another nine months, but for those of us who work slowly and want to pay attention to detail, it’s time to begin. Over summer break, my gaming obsession was the Portal series. I’d heard some pretty epic things about it before, but I never got around to playing it until Steam’s fourth of July sale. I saw I could get both Portal games for five bucks, so I thought, why not? It’s only five bucks either way. It was even more awesome than I expected. Now, this isn’t a review, this is a cosplay DIY tutorial/walkthrough/demonstration, so let’s get started. 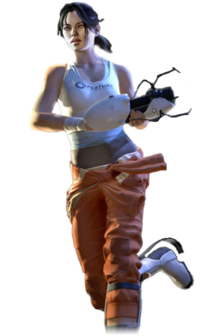 Chell is the protagonist of the Portal series; I’ll be cosplaying as the Portal 2 version of the character. I decided to tackle the long fall boots first. It took me a while to find a good pair of shoes to use for the structure of the boots. Target and Walmart yielded nothing; it was too early in the year to find cheap knee boots. I didn’t find adequate shoes at Payless, but I magically found a pair of gray leggings with a blue band at the top (who would’ve thunk they even made those?) and snatched them up in about two seconds. I finally ended up going to Amazon. 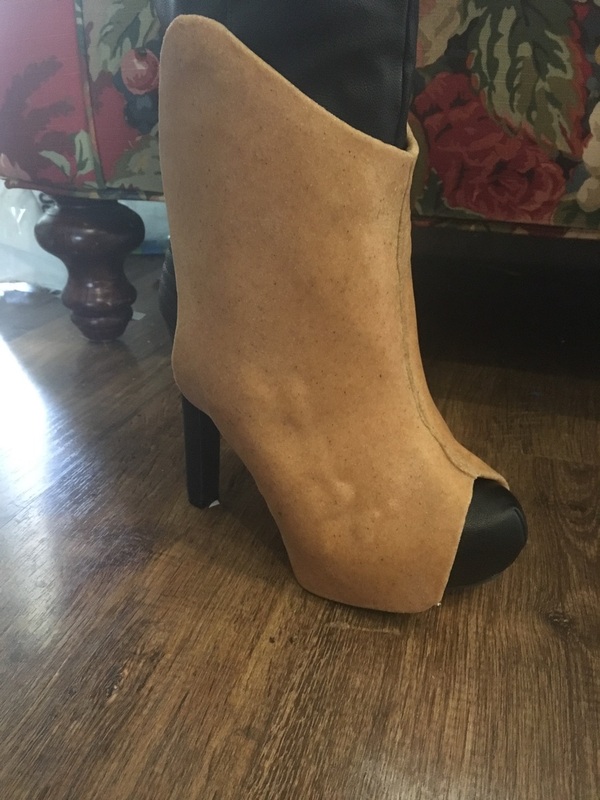 It took a while, but I finally found a pair of boots in the right size and color, with an accurately sized heel and platform, for only $7. They’re extraordinarily cheap and not exactly the prettiest, but they’re perfect for the purpose. First I had to cut off the little buckles at the top. They didn’t serve any purpose except looking pretty, so it wasn’t a problem. Some people make their sewing and crafting patterns by measuring and eyeballing the shape. Not me. Not only are my math skills questionable, but, since the boots’ design is slick and geometric, symmetry is a must. Instead of wearing the boot to make it hold its shape, I stuffed it with Walmart bags. No plastic bags were harmed during the making of this cosplay. As of now, anyway. I then proceeded to cover it with tissue paper, and then with masking (or painter’s) tape. 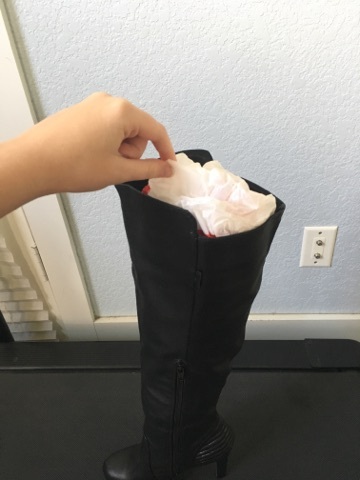 DON’T skip the tissue paper, because if you do, your pattern will be stuck to the boot, and something is going to get torn if you try to take it off. 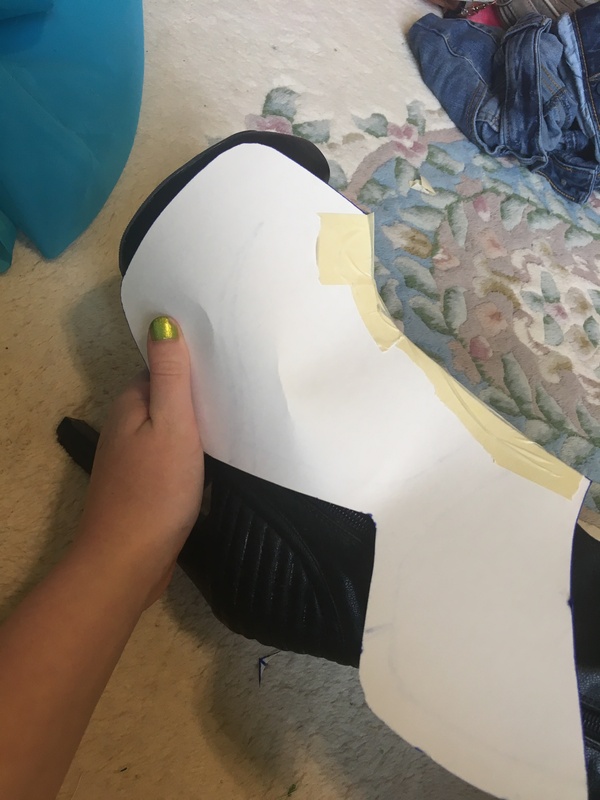 Using the seams as a guide, I drew two Sharpie lines down the front and back of the boot. That’s my hand. Isn’t it cute? And now comes the tricky part: drawing on the details. 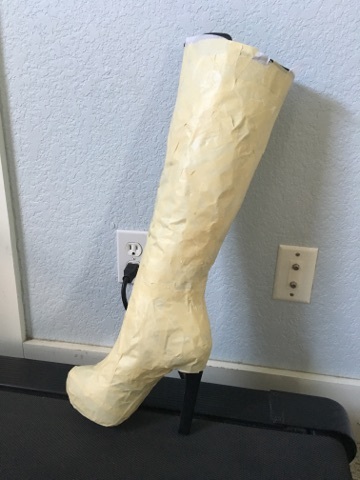 Using this reference image, I began to draw the lines that will be used to cut out each piece of the boot, carefully measuring each line to make sure they were equidistant from their respective sides of the shoe. But seriously, curves are hard to do. The boot wasn’t symmetrical, and one side looked way better than the other. So I decided to do the half-a-pattern technique. I’d make one half of the pattern, trace it, flip it over, and trace it again, to make a mirrored outline of the pattern. I’d cut it out, and it would be perfectly symmetrical without my having to measure a single thing. And then came my second screw-up. Since now I was only drawing half a boot, I grossly underestimated the size of the plate on the back of the calf. And I cut the pattern off of the boot before I noticed. I fixed this problem by taping up just the top half of the boot, cutting the messed-up part off of the finished pattern, and taping the usable portion of the latter back onto the boot. I ended up with a sort of franken-pattern. Why am I telling you this instead of pretending it didn’t happen? So you know what NOT to do. 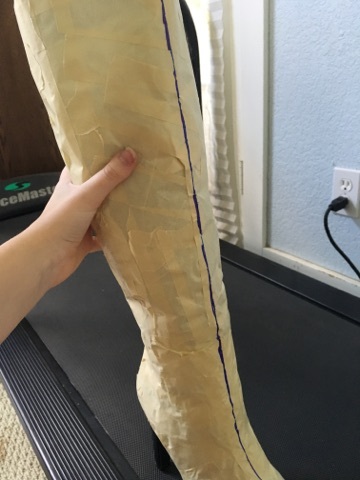 No lasting harm was done to my cosplay (other than a wasted thirty minutes of pattern fixing), but yours will go a lot more smoothly if you don’t make the same mistakes I did. The “finished” taped-up boot (before I fixed the undersized calf piece). Ignore the misplaced line on the bottom of the ankle piece; that was for measuring purposes only. Once my pattern was REALLY finished up, I cut off the unnecessary taped portions (the front of the top and the toe, where the original boot will show through or be cut away) and traced it onto a piece of posterboard, adding an extra half inch or so on the edges that will wrap around the boot (namely the front of the foot and the back of the calf). 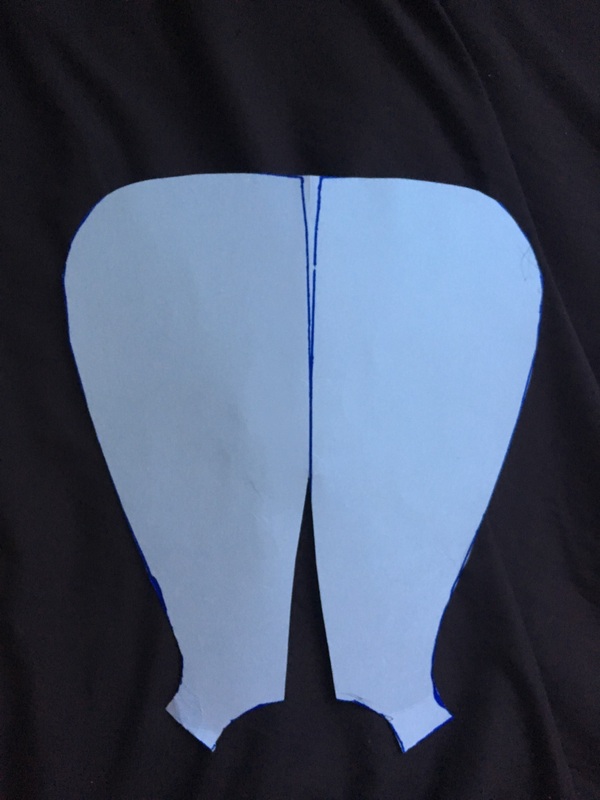 I traced the lines accordingly (all except the little slit on the side of the foot, which I’ll add on later), mirrored the cutout as described above, and made a two-sided pattern. I wrapped it around the boot for size, adjusted a little, and the pattern was done! This is a master template for the patterns I’ll need to cut the material for the long-fall boot. Since I’ll be making the boot in three pieces (the back of the calf, the top piece of the ankle, and the bottom piece of the ankle and foot), I’ll need to use this pattern to create the others. The next step is to create the smaller patterns and find out how much material I’ll need for each. Stay tuned for more updates on my project!